I had to smile at the bevy of polymer clay beauties that arrived in Tuesday’s email…among them these vintage spice tin women and light bulb ladies. Israel’s Naama Zamir builds sculptures over discarded lightbulbs and each character comes with her own story. Ohio’s Diana Cundall has a penchant for spice cans with personalities and she collages ephemera onto polymer clay pendants. You may want to revisit some former PCD recycling favorites as well – Barbara Lang, Dayle Doroshow and Jean Comport come to mind. Keep those suggestions coming in. Thanks to Susan Lomuto for the spice can link. 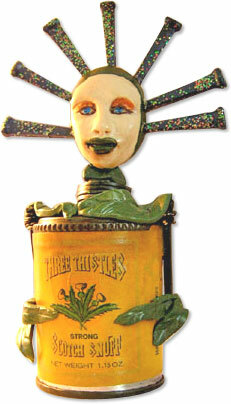 I would like to thank Polymer Clay Daily for featuring my spice tins. What a nice surprise.